← WRAL Tries Out Religious Smear On Lt. Governor. Response? SO WHAT. Joining the ranks of WRAL on the religious bigotry front is the News and Observer. Earlier this week, the news outlet ran a ‘push back’ story about the NC Democrats who were triggered by comments made by the Lt. Governor at the Civitas Institute’s recent Conservative Leadership Conference in Raleigh. What did the Lt. Governor say? That politics is the religion of the Left. The Lt. Governor is 100% correct and the proof of it that is the reactions his statement has garnered. Keep in mind folks, no matter what the Lt. Governor says or doesn’t say, North Carolina media will attack it. Why? Because they must defend King Cooper going into 2020. This is par for the course for North Carolina media. Remember the Laura Leslie-Pulse Nightclub incident where she blamed Christians for the attack? Leslie wasn’t the only one making idiotic statements about the nightclub attack – Tim Funk of the Charlotte Observer blamed House Bill 2. Neither one of them has apologized for their incredible rhetoric, by the way. The News and Observer published responses from a variety of Democrats, including a joint statement by Democratic State Sen. Paul Lowe Jr. and state Sen. Mike Woodard of Durham, which is the epicenter of all things Leftist in North Carolina. Did you notice neither of them actually addressed Forest’s actual point? Yeah, #MeToo! You can read some more concern trolling Democrat comments in the original article, but my favorite was Wake County Commissioner and Doxxing apologist, John Burns. Now, folks, you have to remember that this is the same party who have over the last year grilled Trump appointees on their religion. Then we had the theatrical Corey Booker yelling his questions, like he seems to like to do, at Mike Pompeo. Booker’s line of questioning was pretty darn close to suggesting that Pompeo was unsuitable to be secretary of state because of his personal religious beliefs. 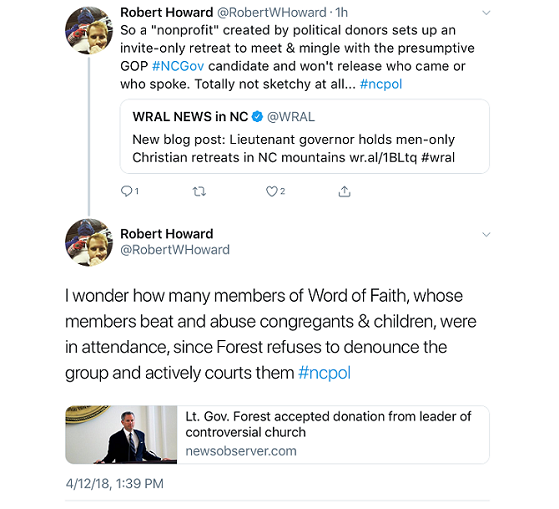 And just last week, the Communications Director for the NC Democratic Party decided that no one could possibly just be practicing one’s faith. But above all, it should be remembered and repeated that this is the party who repeatedly booed putting God and Jerusalem back in their platform at their national convention. A national convention which was held in Charlotte with many of the same NC Democrats in attendance who are now virtue signaling over being called out for what they are: Acolytes of Big Government. This entry was posted in LL1885, Lt. Gov Dan Forest, Media Bias, News and Observer, POLITICS NC and tagged NC Democratic Party, Religious Bigotry. Bookmark the permalink.